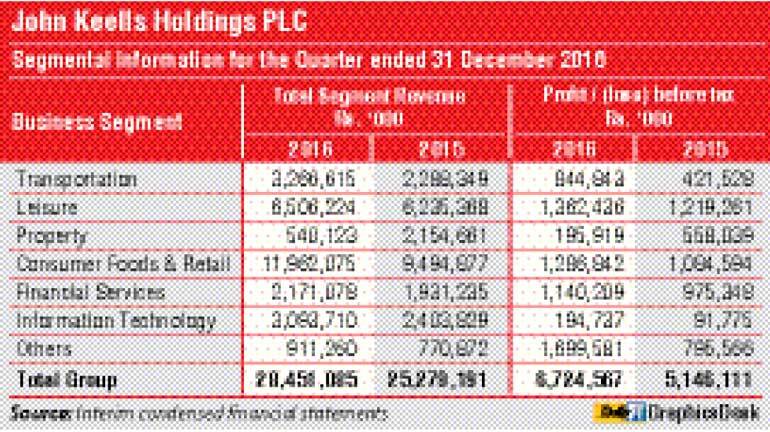 Premier blue chip John Keells Holdings Plc (JKH) yesterday reported strong earnings for the third quarter, aided by commendable performance from several of its core business sectors. The Group’s profit before tax (PBT) grew by 31% to Rs. 6.72 billion in the third quarter and the figure for the first nine months of the financial year 2016/17 at Rs. 15.48 billion was a 22% growth. The profit attributable to shareholders for the third quarter was Rs. 5.15 billion, up by 32% from a year earlier, growing by 18% to Rs. 11.29 billion in the first nine months. The Group revenue at Rs. 27.94 billion for the quarter was a 12% increase and for the first nine months it grew by 11% to Rs. 76.43 billion. Leisure, consumer foods and retail, transportation, financial services and transportation were major contributors for JKH’s bottom line and top line. The transportation industry group’s PBT of Rs. 845 million in the third quarter of 2016/17 is an increase of 100% over the third quarter of the previous financial year. 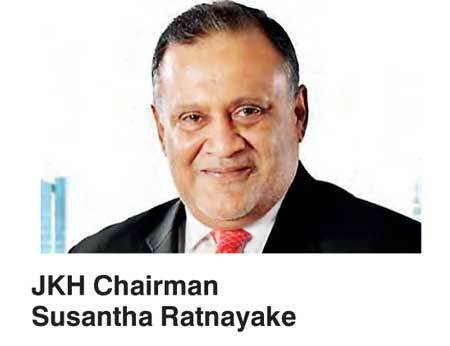 JKH Chairman Susantha Ratnayake said the significant increase in profitability is mainly attributable to the Group’s ports and shipping, and bunkering businesses. During the calendar year 2016, the Port of Colombo witnessed a year-on-year growth of 11% while South Asia Gateway Terminals (SAGT) recorded growth in throughput of 19%. Profitability of the Group’s bunkering business increased as a result of double digit growth in volumes and improved margins. The logistics business recorded a strong performance due to an increase in throughput in its warehouse facilities. The leisure industry group’s PBT of Rs.1.36 billion in the third quarter of 2016/17 was an increase of 12%. Profitability in the city hotel sector and Sri Lankan resorts segment increased as a result of improved occupancy coupled with operational efficiencies and resulting cost savings. Profitability in the Maldivian resorts segment recorded an increase driven by higher occupancy as a result of focused volume-driven strategies in the European markets, the Chairman said. The property industry group’s PBT of Rs. 196million in the third quarter of 2016/17 was down by 65%. The third quarter of the previous year included a substantial recognition of revenue on the ‘7th Sense’ on Gregory’s Road residential development. The construction of Cinnamon Life is in progress with pre-sales of both the residential and commercial space continuing to be encouraging. The consumer foods and retail industry group’s PBT of Rs. 1.29 billion in the third quarter of 2016/17 was an increase of 19%, with both sectors contributing to the improved performance. Ratnayake said profitability of the frozen confectionery and beverage businesses was driven by double digit volume growth and improved margins. The retail sector continued its encouraging performance with steady growth in footfall, contributing towards a year-on-year growth in same store sales, coupled with the incremental contribution from recently established outlets. During the quarter under review, three new outlets were opened, bringing the total store count to 61 outlets as at 31 December 2016. The financial services industry group’s PBT grew by 17% to Rs. 1.14 billion in the third quarter. The increase in profitability is on account of the performance of Nations Trust Bank, which witnessed robust loan growth, together with Union Assurance Plc, where gross written premiums recorded encouraging double digit growth. The information technology industry group’s PBT saw a significant increase to Rs. 195 million from Rs. 92 million a year earlier. The office automation business, which is the largest contributor to profits, witnessed an improvement in its performance due to double digit growth in volumes across its three main product segments. Other sectors, comprising of the holding company and other investments, and the plantation services sector, recorded a PBT of Rs. 1.70 billion, which was an increase of 114%. The increase in PBT is mainly attributable to the increases in finance income due to higher interest rates and exchange gains recorded at the company on its foreign currency denominated cash holdings compared to the corresponding quarter of the previous financial year. The plantation services sector recorded an improvement in profitability due to improved tea prices and other operational efficiencies.